Sally's patients come from a large area. The map below shows the central part (25km by 15km) of this. Click on the centre area of the above map for diagramatic map of practice and car park in Cheadle. 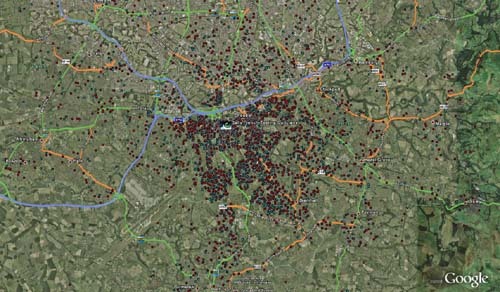 Click on the outer area closer view of local patient distribution. Clickable Google map below shows practice and part of Cheadle Village and a few patients (locations of all patients disguised here and elsewhere). Opened in 1990, Sally's practice is fully equipped and modern. The practice is situated in the small Rectory Court shopping mall (see above) not far from the M63 Motorway and A34 (Kingsway). Rectory Court is opposite Cheadle Post Office, next door to the Tesco Express which opened in November 2009, and close by The White Hart & St Mary's church. The mall joins the Massie Street car park to Wilmslow Road, so the practice is conveniently situated for parking. The car park can only be entered via Massie Street & Charlotte Street as Chapel Street & Brooklyn Street are one-way only. The practice is accessible for disabled patients, being all on one level, and there are also toilet facilities for the disabled within the mall. Regular eye examinations are important in maintaining visual efficiency and as a health care check for diseases like diabetes. Some people may be eligible for a free sight test. All routine eye examinations should include an inspection of the retina to check for disease and this is commonly carried out using an ophthalmoscope. 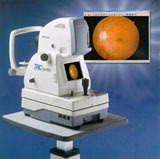 In addition our Topcon Retinal Camera enables us to store digital images of the back of the eye on the computer facilitating the detection of changes. You will be able to see what the optometrist sees. There is a charge of �10 for this service. Sight testing is facilitated by our own proprietary computer software, the UMIST Eye System. As well as offering eye examinations, both private and NHS (for those eligible), a full contact lens and aftercare service is offered. There is a fine selection of quality and designer frames and you are welcome to call in, meet Sally and her staff and have a look at their range of frames in the pleasant and relaxed surroundings. Sally and her Dispenser, Bryan Johnston, will be only too pleased to give you any help and advice you may require. There is a children's area with toys and a large selection of children's frames. If this page has been reached directly, then clicking on HOME above will also restore the frame and left index. Then a click on "HOME" will enable the top links to our other Optometry pages.